For those who have been searching for fun things to do in Howard County, we offer classes for people at all levels of their artistic journey. Come make a beautiful mosaic, stunning fused glass, or get messy on the wheel! Classes are usually a multi-visit process, and are great for families or couples! 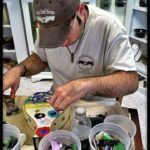 Come out and try the wheel, paint with glass, and create something truly unique and beautiful. 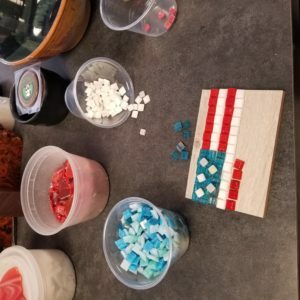 We teach you to cut and attach pieces of glass, beads, and mosaic tiles to create a design on a project base. Project bases are generally wooden or canvas, and can be painted, and your design can be anything from realistic to abstract. Our top-notch teachers are here to help guide you through the entire process. Projects can be taken home the same day. Glass fusion involves stacking, or layering thin sheets of colorful glass to create patterns or simple images. 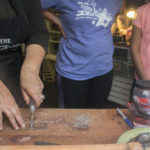 None of our glass is pre-cut; our wonderful teachers show you proper cutting, grinding, and clipping techniques and are available to give tips and encouragement throughout the class. 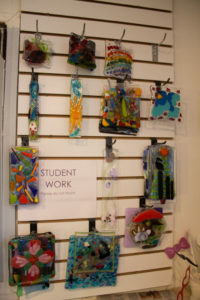 We want you to go beyond the expectations of a typical fused glass class. You’re in charge of your design, and the all the physical cutting involved in the class. You must return at a later date to pick up your finished piece. Once you have the basics of Fused Glass down then the Advanced Fused Glass is the next step in the process. We introduce liquid glass, new cutting techniques, mould prep, multiple firings, and more. Our six week fused glass class goes in to great detail about the compatibility of glass, the history of fused glass, the physics of glass, kiln and mould information, and much more! 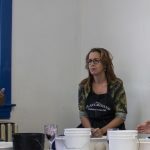 Our Mud & Merlot classes are a great date night activity, they are BYOB and messy! We teach you to throw a vase, cup, or bowl. This class is great for beginners who have never thrown before, or if it has been a while since you have thrown. This is a multiple step process, you will need to return to glaze your piece and then again to pick up your finished artwork. Individuals who choose to drink must be 21 or over. This class is family friendly and anyone under 15 years old must be accompanied by a non-drinking adult. 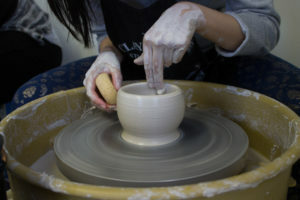 This class is perfect for beginners and those who want to go beyond basics, we teach you to throw a vase, bowl, or mug. We can show you how to add texture and even a handle if you choose. This class is great for beginners who have never thrown before, or those that are more advanced who want to go beyond the basics to add texture or handles to their pieces. This is a multiple step process, you will need to return to glaze your piece and then again to pick up your finished artwork. This class is family friendly and individuals who are under 15 must be accompanied by an adult. Coil pots, pinch pots, and slab construction. Our hand building class is a project based class which allows the student to creatively express themselves through clay. Students are encouraged to explore the limits of the clay. This is a multiple step process, you will need to return to glaze your piece and then again to pick up your finished artwork. This class is family friendly and individuals who are under 15 must be accompanied by an adult. This project based class is for people looking to hone their throwing skills including lids, collaring, and more. This class is family friendly and individuals who are under 15 must be accompanied by an adult. Already have some basic knowledge of the wheel and looking to improve your throwing skills? Brand new to throwing and want to learn as much as you can? This class is for you! Practice and refine simple forms and explore more complex shapes. Basic techniques to throw cylinders, cups, bowls, and more are demonstrated. Various methods of surface decoration and glazing are also explored or expanded upon depending on your skill level. This class is for adults only.